Miniature cheesecakes are a great way introduce both portion control and cuteness into dessert. 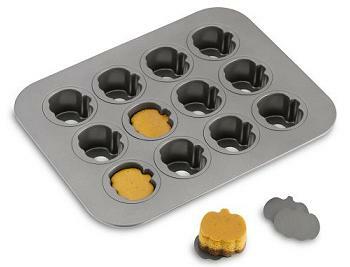 You can always bake them in a muffin pan, but this Mini Pumpkin Cheesecake Pan gives you a few advantages that regular muffin pan doesn’t. You don’t need any paper liners for these pans because the bottoms are removable. All you need to do is loosen the sides of the cheesecake and push up on the bottom of each cavity, and the mini cheesecake will slide right out. The sides of the pan are nonstick, too, which really makes this easy to use.. Also, the cavities are pumpkin-shaped, making them perfect for fall and winter cheesecakes, even if they’re not pumpkin flavored. As it so happens, I have one of these lovely Chicago Metallic Mini Pumpkin Cheesecake Pans to give away this week, and since my cookbook will be shipping in just a few days, I’m going to include a FREE copy of the cookbook along with the pan, making this a giveaway extra special. Now, there are no mini pumpkin cheesecake recipes in the book, but the pan comes with a good basic pumpkin cheesecake recipe to get you started with your pan. To win, just leave a comment telling me what you favorite cheesecake flavor is on this post by Friday, October 23rd . A winner will be selected randomly. Don’t forget to include your e-mail on the form where you leave a comment (not in the comment itself) so I can contact you if you’re the winner! I think chocolate cheesecake is the best cheesecake ever. My favorite cheesecakes are always on the lighter side, fruit flavors, or just plain. But my favorite of all time is white chocolate raspberry cheesecake. Served with some whipped cream and raspberries, its delicious. On our honeymoon in Rockport Mass, we had a warm chocolate cheesecake that was to die for!! That remains my very fav!! hahah, i loved the original cheeckcake from cheesecake factory. I was only able to try it once, and it was awesome! I haven’t met a cheesecake I didn’t like, but plain is right there at the top of my list. any sort of raspberry cheesecake = yum! I’ve only had the usual- vanilla, strawberry, chocolate…. but I’d LOVE to try pumpkin. Any cheesecake will work for me, although I do love the Tiramisu Cheesecake at The Cheesecake Factory! vanilla with swirls of salty butter caramel would have to be my favourite… on a base of crushed speculoos biscuits of coarse. That pan is so cute! To be honest, my favorite is probably just a plain old traditional cheesecake with fresh strawberries on top. I have to say I’m a traditional girl when it comes to cheesecake flavors. We have a family recipe that I just haven’t found a replacement for. But pumpkin and key lime are definitely contenders for a runner up! I absolutely love this cheesecake I had once that was lemon-raspberry. I will also take anything involving chocolate and caramel. My favorite is banana cream cheesecake. Mmmmmm so good! a favorite cheesecake? really? just one? how bout i give you my least fave, that would be easier. not a fan of the super, sweet, rich chocolatey ones. i’m more into the traditional with fruits or key lime – yum. oh and i love white chooco raspberry. but like a snickers one or something like that – not so much. I love vanilla bean cheesecake with salted caramel! Key lime, for sure. I like it so much, it’s what we’re having for our wedding “cake” in December! oreo is my favorite – I haven’t tried to make cheesecake yet – maybe this would give me an excuse! Thanks!! Salted caramel. And Oreo. And Vanilla bean. Is putting all of these together gross or awesome? I might have to try it! I’d have to go with the classic cherry cheesecake. Such a comfort food! Its a toss up between raspberry cheesecake and caramel apple cheesecake. Mine has and always will be blueberry cheescake. Lemon cud comes ina close second…The pan is adorable..
My favorite that I’ve had is my boyfriend’s fabulous blueberry cheesecake. This holiday season though, I want to try to make a peppermint candy cheesecake… we’ll see how that goes! Mmm, yummy cheesecake choice would be either pumpkin or carmel. I love the pumpkin pan, to cute! And a cookbook to, how generous of you! I love plain cheesecake w/fresh berries!! I love all flavors of cheesecake, but I also love fall, so right now I’d have to say Pumpkin!! My favorite cheesecake flavor is plain old vanilla (as in New York cheesecake) with strawberry topping. I love chocolate cheesecake! I love this pan too! sooo adorable! i love plain cheesecake; but pumpkin is awesome too! ooh, and oreo cheesecake. just love cheesecake in general! I love this double chocolate chip cheesecake recipe that I have. It’s so decadent that I only pull it out on really special ocassions. I love lemon cheesecake and oreo cheesecake. That pumpkin pan is adorable! I like plain ol’ new york style cheesecake; call me boring! Mmm, cheesecake! Caramel Pumpkin Cheesecake is my faaaavorite. I could eat it everyday, yum! I love cookie dough cheesecake! mmmmm favorite cheesecake is probably vanilla with raspberry as a close second. Very excited for your book to come out, congratulations! My favorite flavor of Cheesecake is banana cream…which is odd because I don’t really like bananas all that much themselves. That pan is so full of win it hurts. A cookbook to go with it? WOW. My favorite flavor is turtle, no doubt! But I’ll go for regular ole cheesecake any day, too!